The Chinese has different variations of ‘bao’ such as charsiew bao and xiao long bao found in dimsum, whereas the Westerners have Han bao bao （汉堡包) known as burgers. 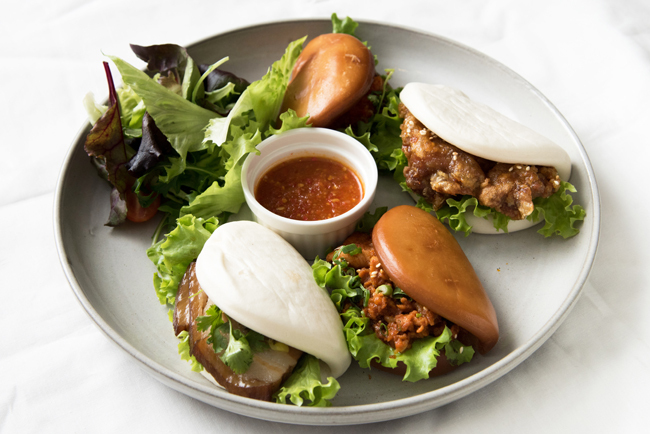 Bao Makers is a bakery cafe specializing in another type of ‘bao’ 包, the Chinese style steamed buns American-Chinese restaurants are known to serve, similar to the famed Momofuku Pork Buns and Lokkee’s Spicy Chicken Buns. 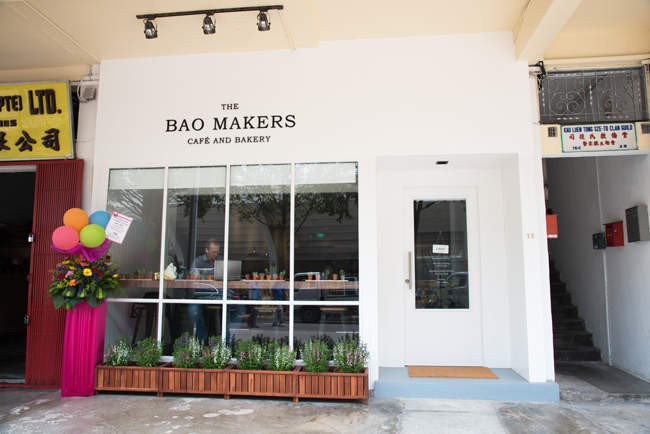 Hot from the oven (literally) are the Bao Makers, which took over Windowsill Pies at Horne Road. 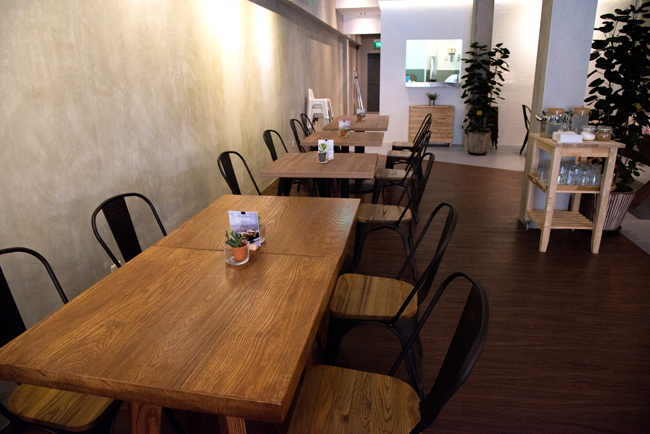 It may be difficult to miss the entrance, because of its white-washed walls (that reminded us of a Big White Bao). The interior has an industrial look with 3 colour tones used: white, grey, brown. 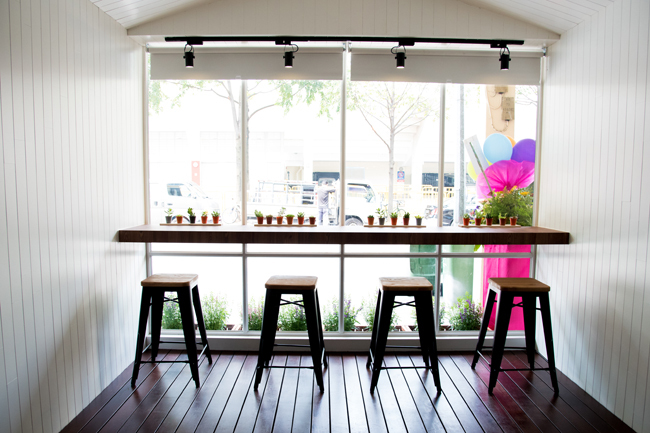 The bao shop now comes with a hipster look. The baos were served in pairs, and recommended ones include the Salted Egg Shrimp ($15) and Chilli Crab ($16). For those interested to try a variety of different flavours, the Bao Platter ($28) came with 4 baos: Classic, Bulgogi, Chilli Crab and Teriyaki Chicken. Our favourite was the Chilli Crab ($16), with fleshy, succulent crab meat and generously splattered with chilli sauce, kiap-ed (sandwiched) in between the deep fried golden brown “bao”. A version to our usual practice of dipping the mantou into the chili crab gravy. The extra chilli sauce provided reminded us of those used in Hainanese Chicken Rice. Perhaps we would see a Chicken Rice Bao in future? 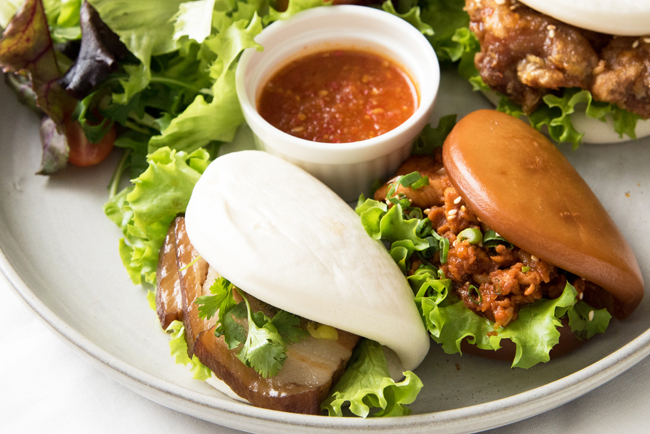 The Classic ($12) with 4 thinly sliced, slow braised pork belly (Kong Bak) sandwiched within the traditional white fluffy buns was a safe option. Soft, fatty, with a melt-in-the-mouth sensation but our neighbouring table quickly rejected the idea of paying $6 for a kong bak bao. The pan-fried Teriyaki Chicken ($14), on the other hand, was a tad too dry. 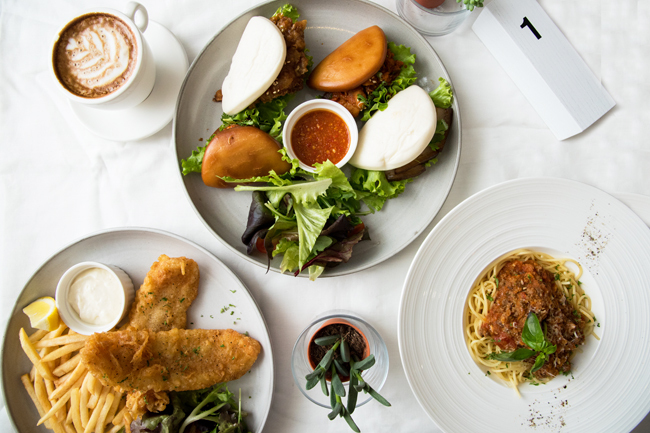 Apart from their Signature Baos, the menu had a selection of the usual sides such as salad ($8 – $10) and truffle fries ($8), mains such as Seafood Platter ($18.90) and Seafood Pasta ($16.90) and Ice Cream Bao ($5) for dessert. 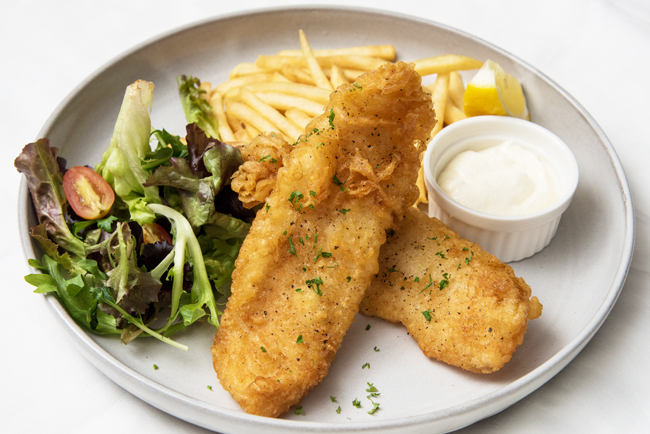 The Fish & Chips ($16.90) were thin battered, crispy with tender meat, and served with homemade aioli. Pretty decent, yet nothing out of the world. 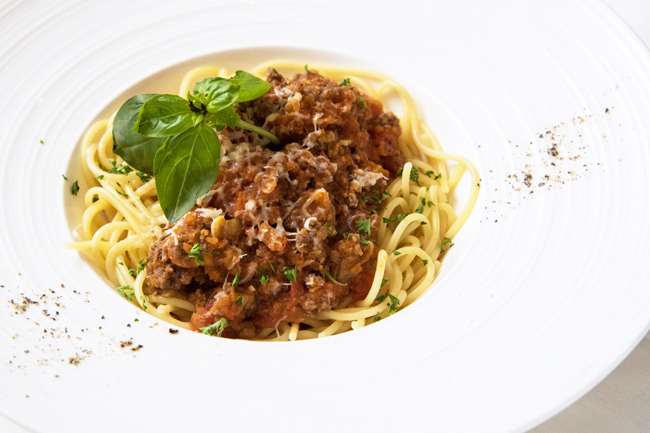 The Rustic Beef Bolognese ($12.90) were cooked to al dente with tomato sauce. 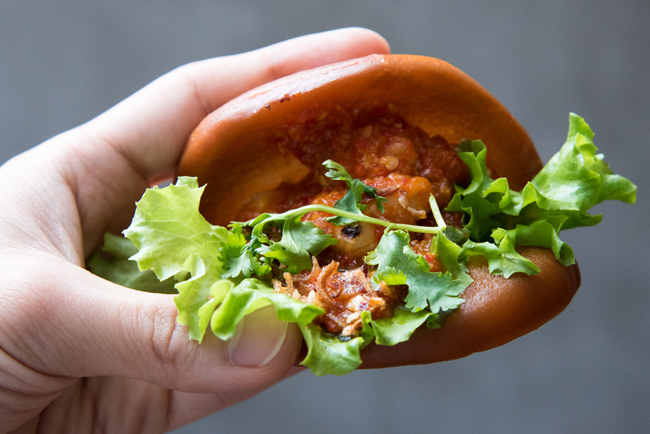 Even though it’s not a bao, the portion didn’t make us feel “bao” (full). 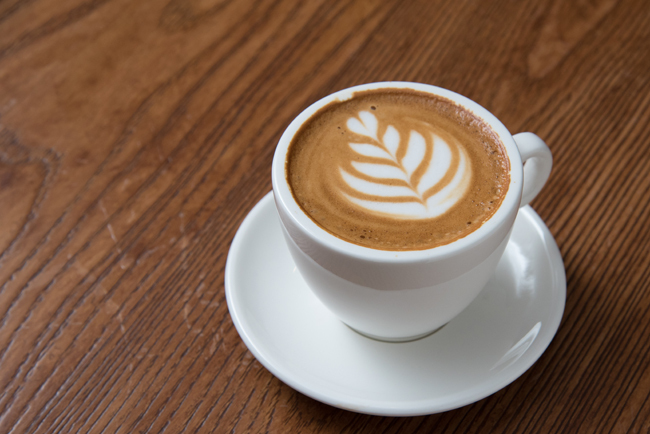 The Flat White ($5.50) was prepared using coffee beans supplied by Common Man Coffee Roasters, with a medium body. “Not bao”, my friends said. Not full. * Written by Daniel’s Food Diary Cafe Correspondent Nicholas Tan. Find him @stormscape on instagram and snapchat.